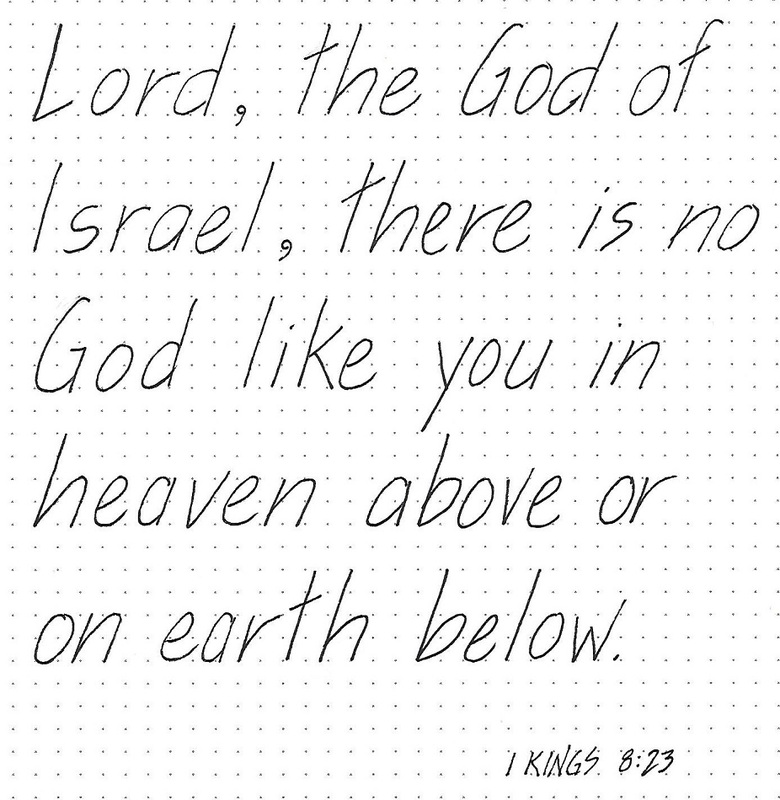 This post is to show the next three days of the 30 Days Of Bible Lettering challenge. In the class Typography for Bible Journaling, the lesson was on Line Weights. April 13 - Philippians 4:6 - Do not be anxious about anything, but in every situation, by prayer and petition, with thanksgiving, present your requests to God. April 14 - Psalm 84:10 - Better is one day in your courts than a thousand elsewhere; I would rather be a doorkeeper in the house of my God than dwell in the tents of the wicked. April 15 - 2 Corinthians 1:4 - who comforts us in all our troubles, so that we can comfort those in any trouble with the comfort we ourselves receive from God. I'll be ack in three days with more of this project. I am sticking with the Easter themed songs this month and it was time for another old favorite... 'He Lives'. I gave my page a stylized figure, singing praises to accompany some handwritten lyrics. I have a couple ore ideas on this theme to complete the month. The next 3 lessons in the Typography For Bible Journaling class were on combining fonts. I had already been doing this so basically continued with what I was doing. 11 - Psalm 107:9 - for he satisfies the thirsty and fills the hungry with good things. 12 - 1 Thessalonians 5:11 - Therefore encourage one another and build each other up, just as in fact you are doing. This week the decorated hymn assigned was 'Because He Lives'. First, let me say that I was stunned to find that this hymn was NOT in my book! WHAT?!?!? I had to find the sheet music online, resize it and cut it out to tip in. When I do this, I put it where the page number says it should go and then I add it to my hymnal index. I went with a straight-up resurrection theme for my drawing and did all the coloring in markers. I took some of what I learned in the class Typography For Bible Journaling and applied those principles for the lettering. I did the tipin with just a fine line of glue at the inner edge and closed the book to dry. The next series of lessons for Typography class were related to Serif letters. 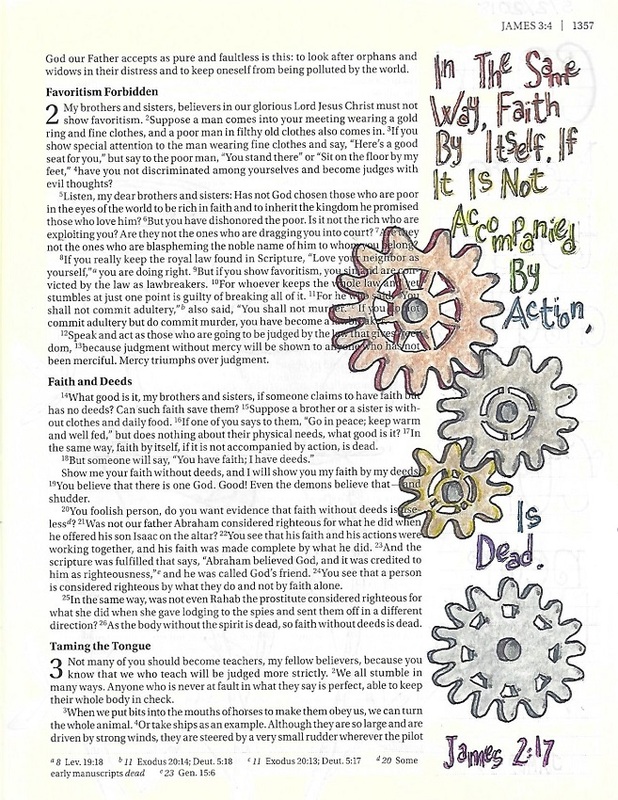 Again, I used scriptures from the 30 Days of Bible Lettering challenge for my homework. April 5 - Proverbs 16:24 - Gracious words are a honeycomb, sweet to the soul and healing to the bones. The lettering lessons continue - this week in the book of James. 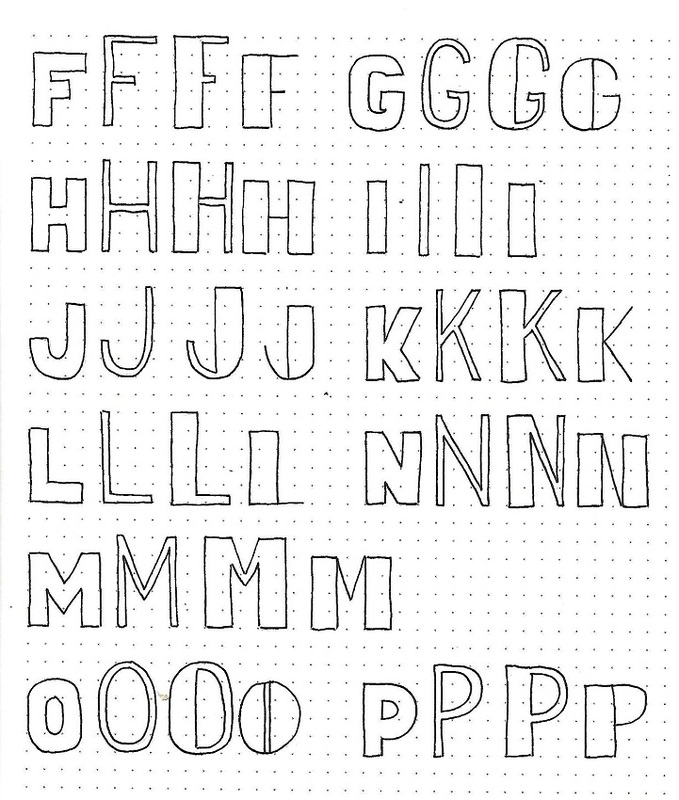 I tend to like my lettering all lined up in neat rows, showing off their symmetry and consistency. But every now and then it is good to let them loose to play a little. We’re going to concentrate on that aspect this week while using the basic oval letters. 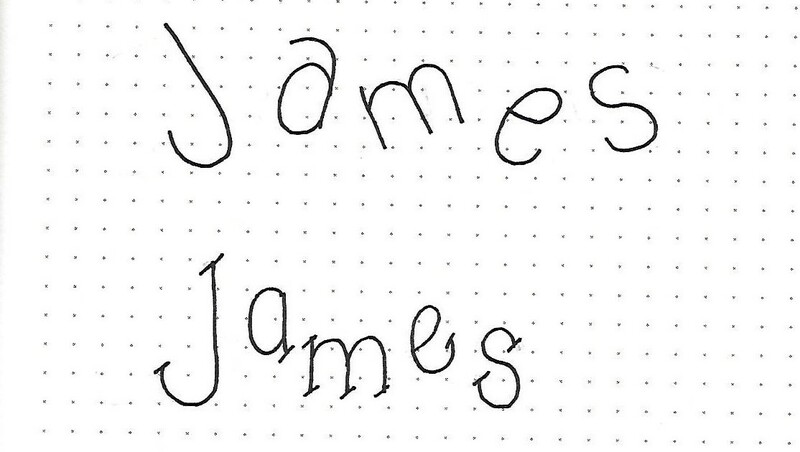 To begin, letter the word ‘James’ in a couple of bouncing styles. On one, twist the letters this way and that while allowing them to float at varying distances above the base line. On the next, Only allow the bounce to be vertical without any tilt to the letters. I think the hardest part of bouncing letters is keeping the sizes consistent when you don’t have that baseline and other guidelines to key off of. So it is especially important to draw out the letters first in pencil and make any edits in conformity before inking. 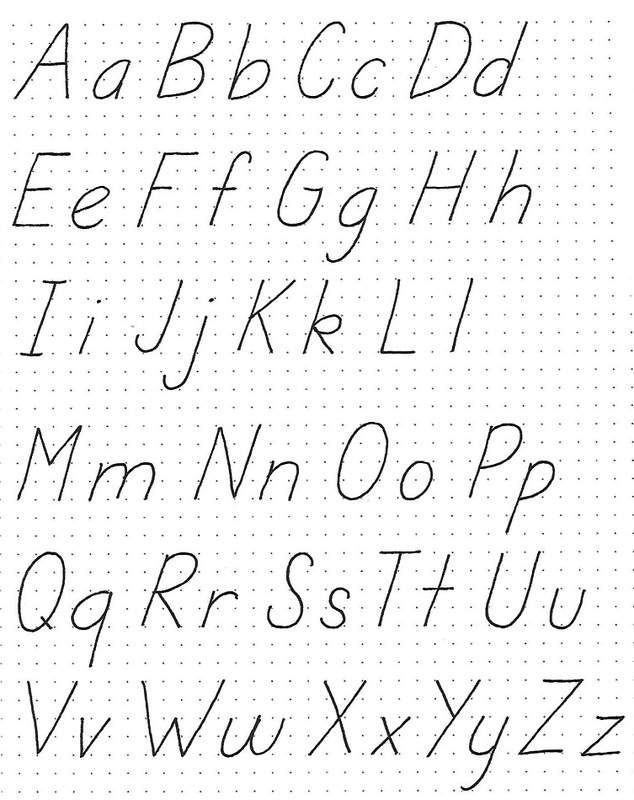 Practice bounding your basic oval lettering on a full alphabet. 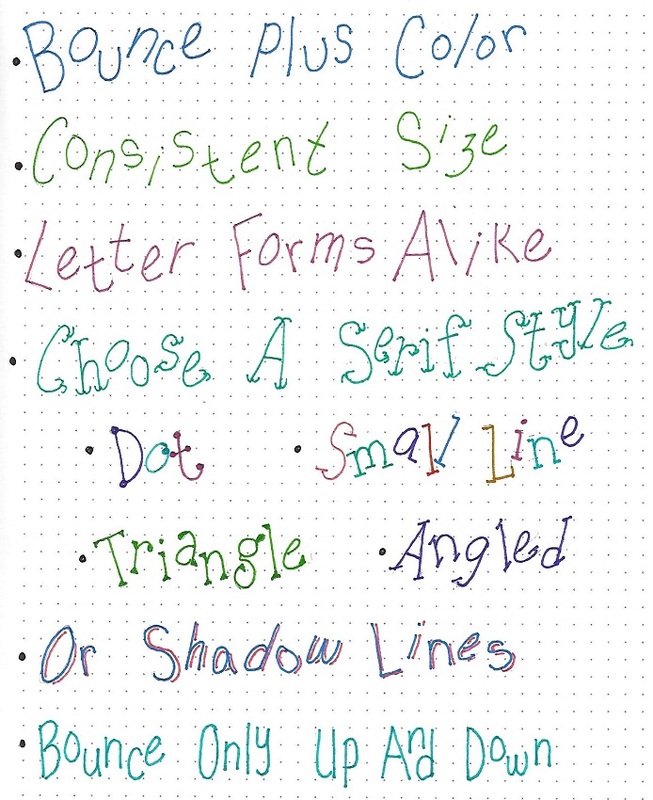 Include some of your alternative letter forms as well. While you’re at it, you might toss in a set of numbers for future reference. Today we will practice writing words with bounced print lettering. There are so many options (not all of them are listed) that I included the samples and pointers right in the practice piece. I did all of my lettering in pencil and then drew them with colored markers. Try this out for fun! For more practice, choose your favorite technique from yesterday’s practice and write a block of text using it. You’ll notice how much less frantic it appears when you confine yourself to only a few options. I used vertical bouncing with slant serifs and no color. For my Bible page I used vertical bouncing with shadow lines and added a rainbow of color to the letters. Like yesterday, I want you to choose a favorite style from Day 3 and use it in your bible in the book of James. I combined mine with the Drawing Room lesson on ‘Gears’. I signed up for a new class called Typography For Bible Journaling in which the instructor teaches how to use your own handwriting to letter scriptures attractively. There are 10 lessons and each lesson contains 3 challenges using the same design principles. So, when I heard about a challenge - 30 Days of Bible Lettering - I decided to combine the two activities. The numbers work out perfectly. I use theinformation in the lessons but use the scriptures from the challenge in the place of those shown in the class videos. I will post these in sets of three... the three that represent a single lesson theme. So here are the three lettered scriptures that go with the lesson for Sans Serif Letters. 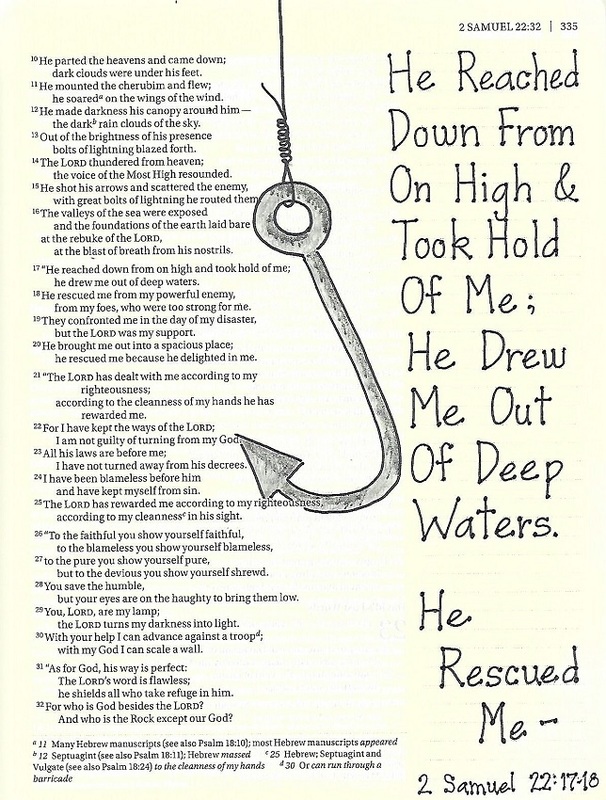 April 1 - Psalm 23:3 - he refreshes my soul. He guides me along the right paths for his name’s sake. April 2 - Joshua 1:9 - Have I not commanded you? Be strong and courageous. Do not be afraid; do not be discouraged, for the Lord your God will be with you wherever you go. April 3 - 2 Corinthians 5:7 - For we live by faith, not by sight. I'll be back with more in a few days - all month long. This is reported to be the hymn that the largest percentage of people list as their favorite. The concept for this crown of thorns is one I developed a couple of years ago and used in my Bible. But I like this version much more than the original. The use of the nails to form crosses and to stand in for the thorns says so much. I used the same technique for the wood on the cross that I usually do - draw in the wavy lines with a medium dark colored pencil. Then color over everything with a medium light colored pencil. I used a script lettering for the lyrics up the left edge. Time for the weekly post of another lettering lesson. 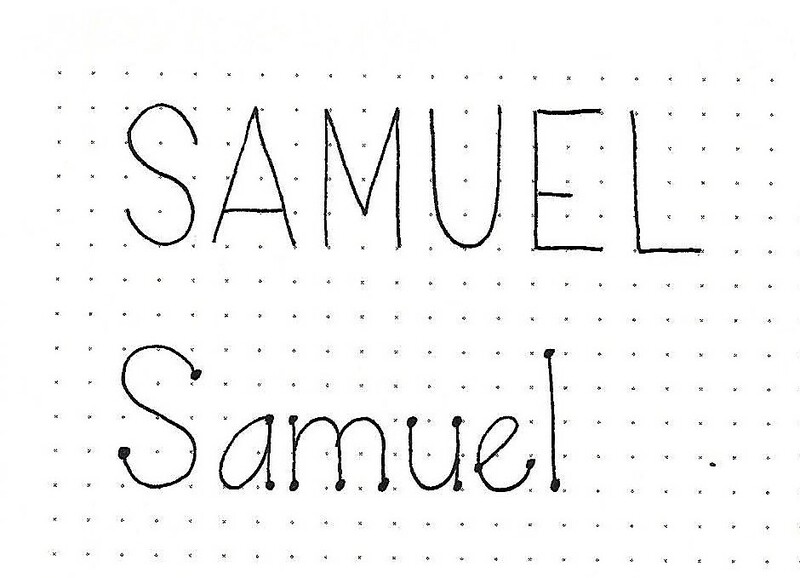 This week we cover 1 and 2 Samuel. Having spent so much time on block letters we are now going to move on to another simple print style and then explore variations on it. The style we are starting with is called a basic oval print. The general letter construction is very similar to the basic round but the letters are narrower and, where there are ‘bowls’ on the letters they become an oval that sits at an angle, tipped to the right. You don’t see much evidence of this in the all caps version of the sample below but it does show up more in the lower-case ‘a’ and ‘e’ in the second line. 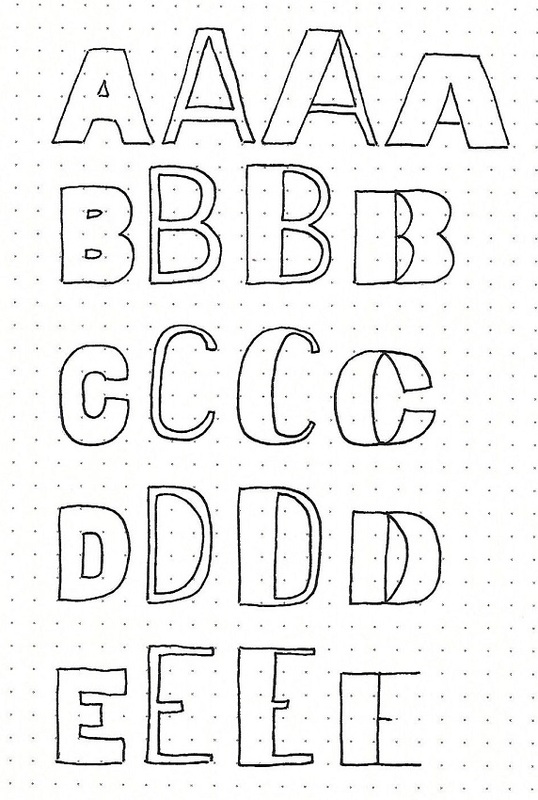 Practice drawing these letter forms. Remember to work first in pencil, correcting your letters as you go. Only ink when the letter is exactly how you want it, then erase the pencil. 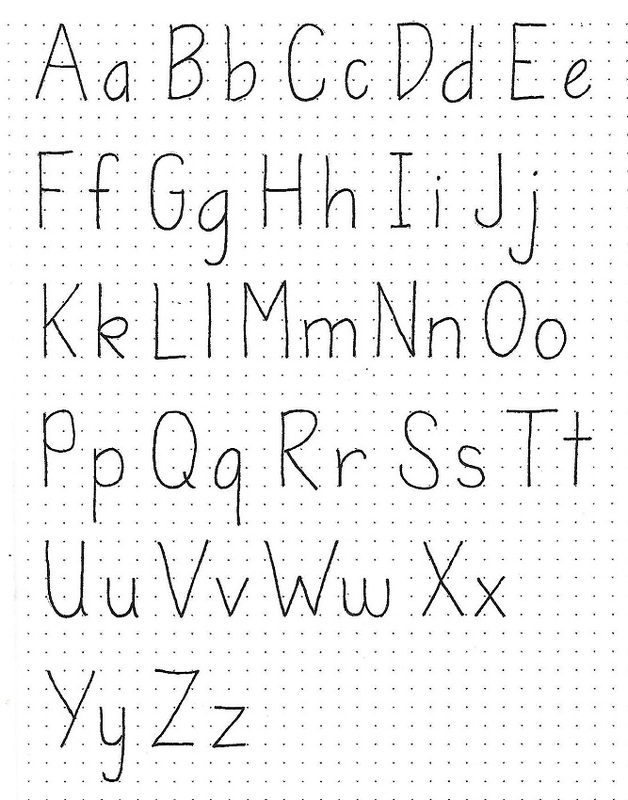 This is the full alphabet for the basic oval print style. Note that the ‘bowls’ of the letters are oval in shape and have a slight lean to the right. The uprights, however do NOT lean. The letters are narrower than the basic round print. The x-height is still ½ the full letter height. Creating the dot serif style is very simple. 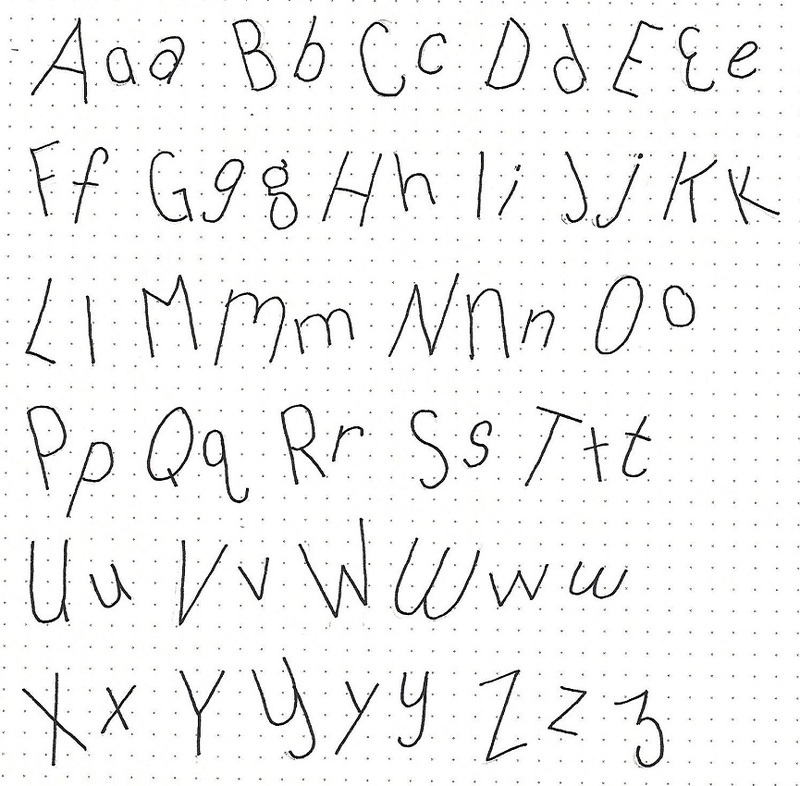 First, write out another copy of the basic oval style alphabet. Then draw a small dot on all of the line ends and intersections. It is fun to let these letters bounce off the baseline and use a mix of colors in your text. For my sample page, though, I toe the line so I can make sure the relative sizes and shapes are correct. 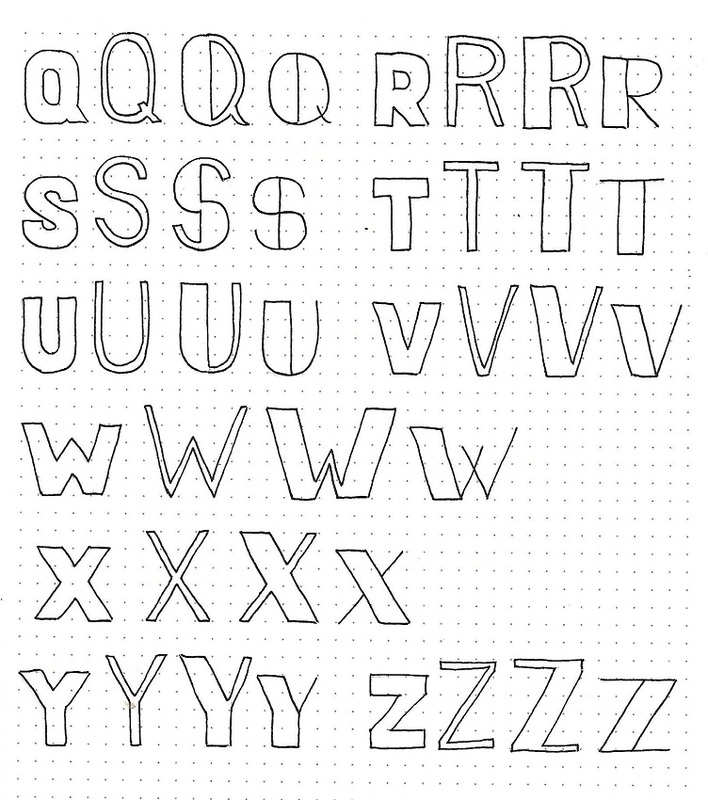 The play can come into use when using the alphabet on a project. To make numerals that fit with the basic oval and dot serif styles you really have a lot of leeway. 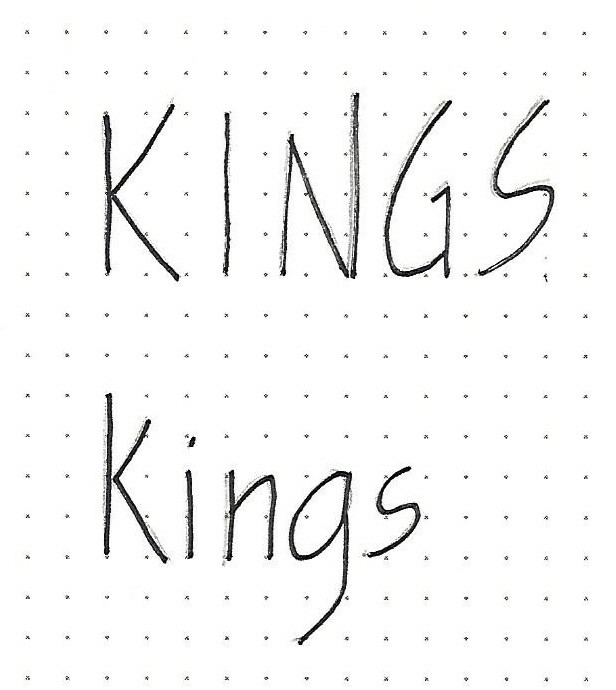 The keys will be: make the numbers as tall as your upper-case, keep them upright, make narrow like your letters. Other than that, you have the choice of how your digits are shaped. Do you like a 9 with a straight stem? Boom! You got it. How about a 4 with an enclosed top? Your choice. 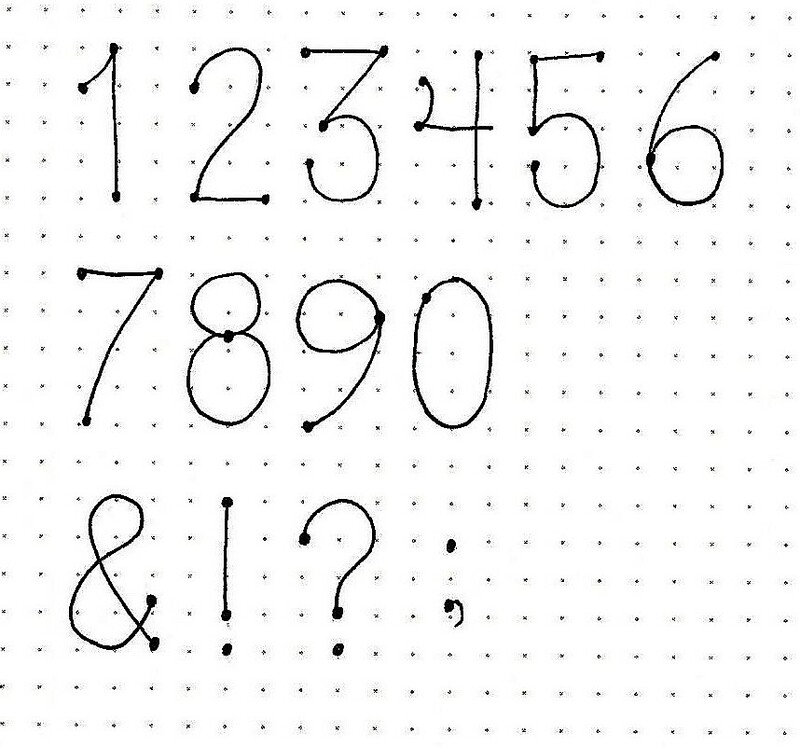 For the dot serif numbers, just add that dot at all line ends and intersections. 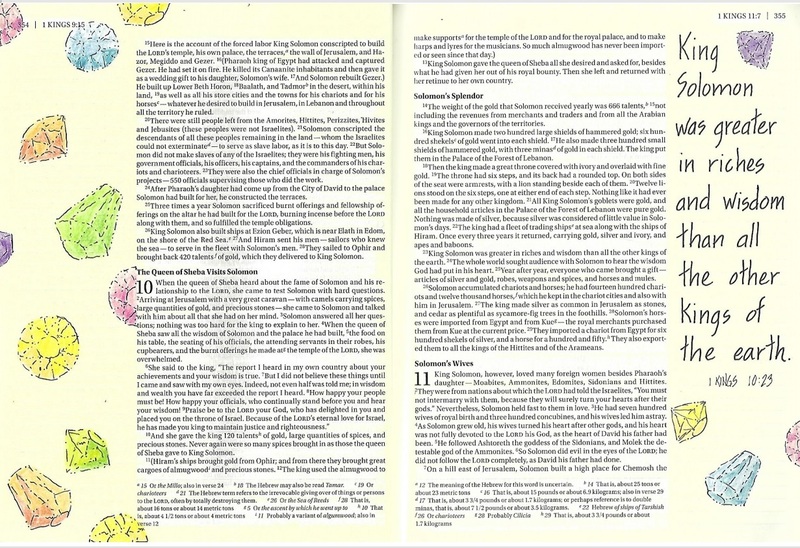 For my Bible page in 2 Samuel, I used the dot serif style in a very straightforward manner. This style is easy to scale up or down – see the reference at the bottom of the page – while remaining very clear and readable. Note that the smaller the lettering, the more prominent the dots become. 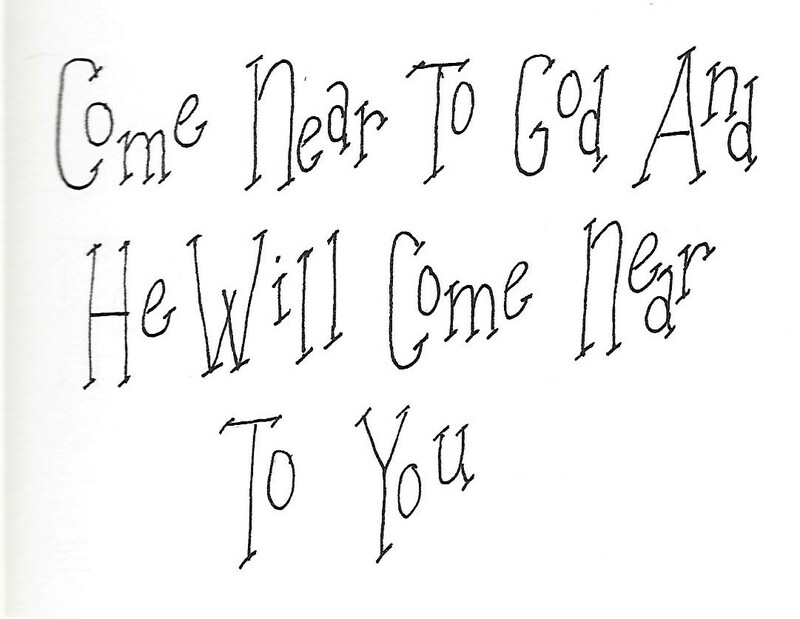 I combined my text with the simple illustration of the fish hook from the Drawing Room tutorial. And now, I have finished my Whimsical Drawing class, too. Whew! 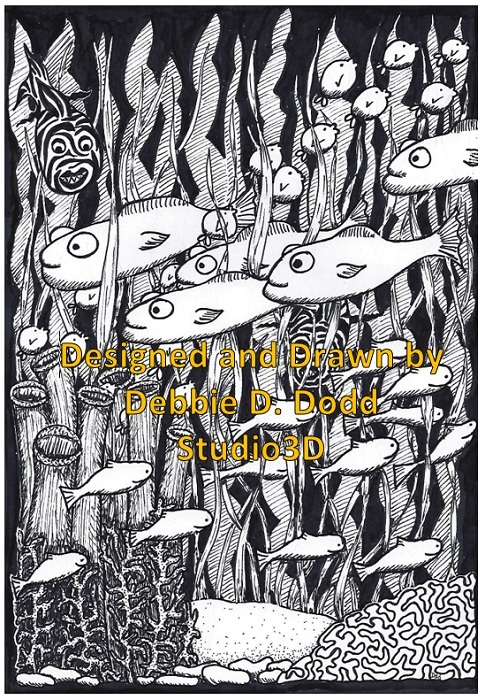 The final idea was to create an underwater scene. These are all my orn original fishes, corals and seaweeds. As with the other whimsical drawings I was able to find an appropriate scripture to accompany it in my interleaved bible. So, two classes completed? Now I can get back to the Colored Pencil Jumpstart class and start a new class (April 1) on Typography for Bible Journaling. The final lesson in this class was on rendering metal and glass. I worked from the photo provided and I think I got a good result. 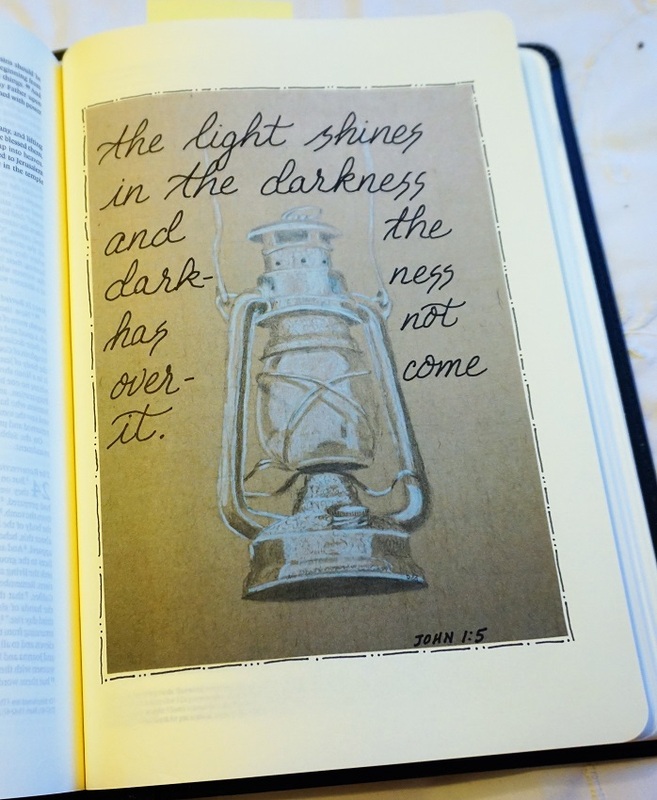 I reduced a scan of this one for my interleaved bible and lettered scripture to surround the lantern. I think I might have to find some photos to use the techniques I learned in this class. The instructor for Whimsical Drawing designed some crazy little birds in various positions perched on branches. 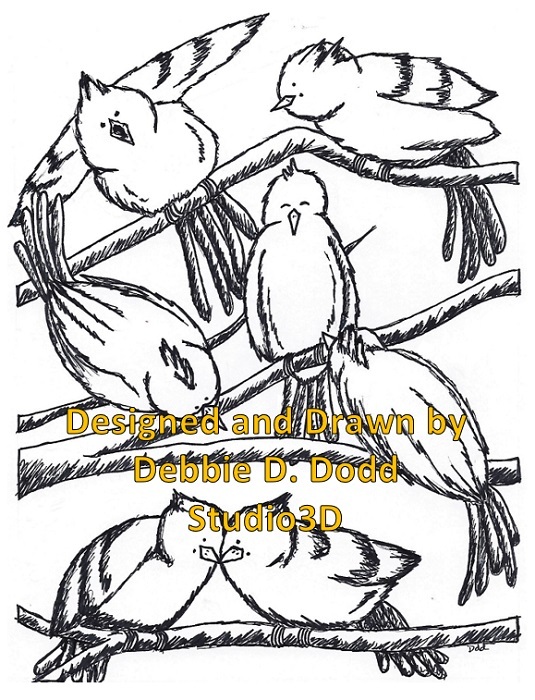 I paid more attention to the original artwork when drawing this because of the need to get the birds right. Mine are moved around a bit as they did not fit with the sizes I made them. 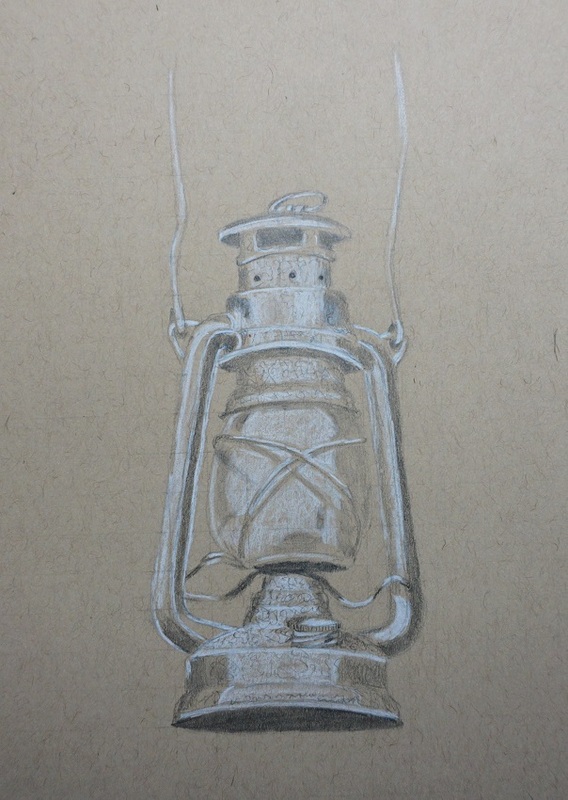 I also did more preliminary sketching on this one than with the previous drawings. This whimsical drawing was also reduced and colored with markers to go in my interleaved bible. I added a block of hand-written scripture at the bottom of the page. 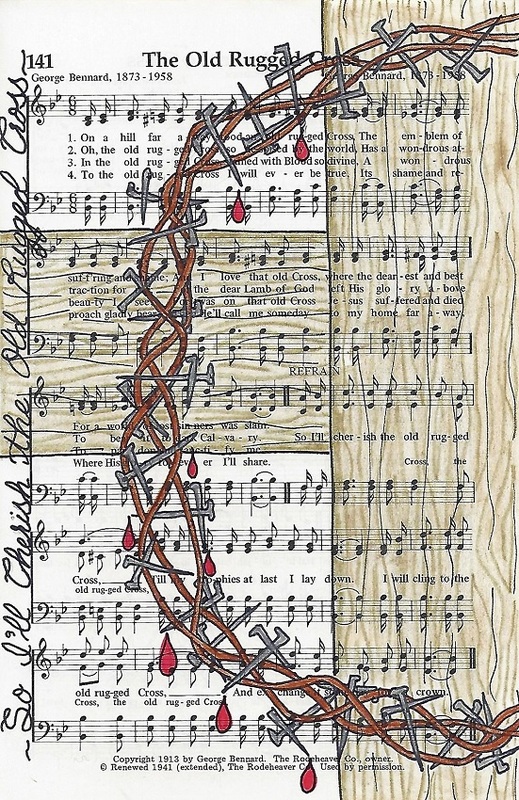 I'm not sure I've done anything like this artwork since I started with Bible journaling. In my Bible it would block out the words and I do not want to work like that. But in my hymnal, that is just fine with me. This week we are working with 'Just A Closer Walk With Thee'. 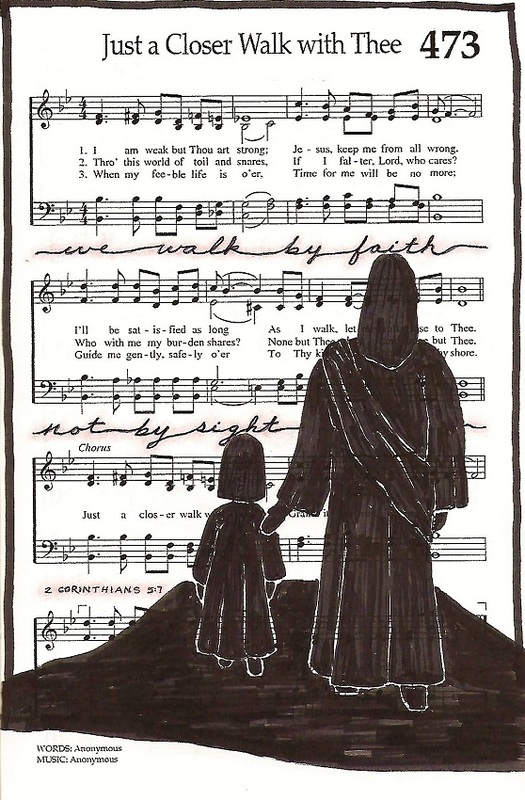 I kept the illustration very simple and interspersed an appropriate scripture in the spaces between the musical staves. When the written words blended in too mush, I went over them with a light pink marker to give them just a bit of contrast. Wow, we are up to week 12 in the year and this series of lettering instruction. This week we are working in Ruth. Having done a lot of work with basic block letters, it’s time to show you more ways to make changes to the form. 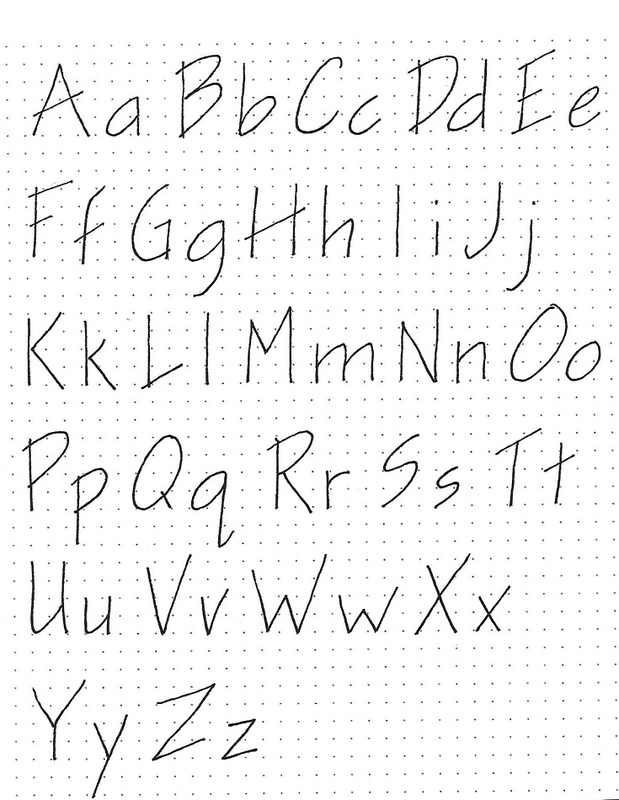 For the sample introduction I started by penciling the basic forms and then bounced some up off the baseline, changed some to lower-case, loosened up the tails and crossbars, and overlapped letters. Somewhere along the line they stopped looking like basic block letters at all! This week we will work on making three entirely new alphabets just by varying height and the width of the elements of the letters. For now, let’s just start with this one word – but, make up your own version of edited letter forms. 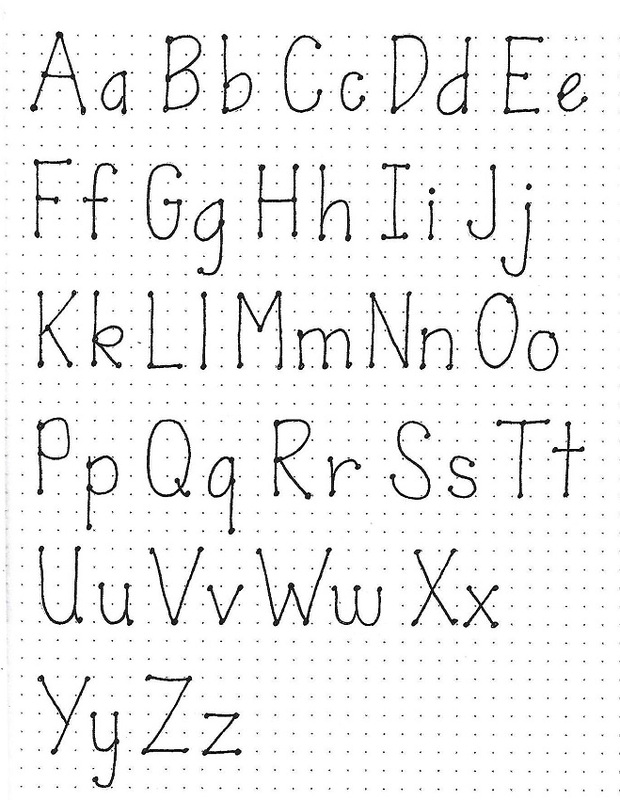 Rather than working all the way through one alphabet style and then another and another, we are going to work on making all the style variations on a letter by letter basis. The first letter is the basic block letter we originally learned – 4 units tall, about 3 units wide, elements 1 unit wide. We draw it here to serve as a reference point. The next letter is 5 units tall, about the same width, and the elements are ½ unit wide. WOW! What a difference that makes. The third version is the same but the left element is widened to 1 ½ units. And the fourth style is back to the 4-unit height, vertical elements are 1 ½ units wide and horizontal elements are a single line. So different, aren’t they? There are many more ways to change these up. If you want to explore other ideas, just add your new forms on the right. Today, we are just doing the letters A through E. The rest of the alphabet will be done on days 3 and 4. We’re back with the next series of letters in edited block letters. Just as yesterday, the first letter is the basic block letter we originally learned – 4 units tall, about 3 units wide, elements 1 unit wide. We draw it here to serve as a reference point. We will finish this project tomorrow. And today we have the final series of letters in edited block letters. Once again, the first letter is the basic block letter we originally learned – 4 units tall, about 3 units wide, elements 1 unit wide. We draw it here to serve as a reference point. Have you been adding any other forms?